You are currently browsing articles tagged Kennedy Smartt. August 11: Steering Committee Announcement. The big announcement for a continuing Presbyterian Church outside the Presbyterian Church, US was made on August 11, 1971 at the Journal Day gathering. Much prayer and planning had gone into this point. The July 15 devotional spoke of the first strategy meeting earlier in the year. Now on this day was the unveiling of the whole plan, with those who were willing to take the lead for this historic departure. The Steering Committee consisted of the following: Donald Patterson, Chairman, James Baird Jr., Leon F. Hendrick, William E. Hill, Kenneth Keyes, John E Richards, John R. Richardson, Kennedy Smartt, G. Aiken Taylor, S.A. White, Ben Wilkinson, and Jack Williamson. Words to live by: When tough decisions have to be made, God provides faithful and courageous men to stand up in the gap for His church. Such were the above mentioned names who agreed to serve on the Steering Committee for a continuing Presbyterian Church faithful to the Scriptures, the Reformed Faith, and the Great Commission of Jesus Christ. Today, the Presbyterian Church in America continues her ministry to a watching world because of their historic stand. We should praise God for them and honor them because they honored God. It is my privilege to announce to you that the men on the platform with me now have been officially named as representatives from their respective boards to a steering committee. They represent the Presbyterian Evangelistic Fellowship, the Presbyterian Journal, the Presbyterian Churchmen United and the Concerned Presbyterians. Here is visible proof of the unity of conservatives working toward a common goal. These groups have reached a consensus to accept the apparent inevitability of division in the Presbyterian Church US caused by the program of the radical ecumenists, and to move now toward a continuing body of congregations and presbyteries loyal to the Scriptures and the Westminster Standards. This steering committee has been charged with the responsibility of developing and implementing a plan for continuation of a Presbyterian Church loyal to the Scriptures and Reformed faith, recognizing that the Sovereign Holy Spirit may be pleased so to revive our Church as to make revisions in the plan necessary. This committee held its organizational meeting last night. I was elected its chairman; Jim Baird, its vice-chairman; and Kennedy Smartt, its secretary. This plan anticipates the involvement of every single congregation in our Church that is interested in preserving the historic witness of our faith. You will be given the opportunity to participate soon. We sincerely believe that the Holy Spirit is leading us in this direction. We know that any result which is pleasing to Almighty God shall not be accomplished by our might, nor by our power but by His Spirit. Therefore, we urge and implore you to undergird this effort daily with much fervent prayer that God will fill us with His Holy Spirit to guide us in this tremendous undertaking. This is truly a historic day for all of us. We resolutely set our faces in a new direction. We shall, with God’s help, preserve for future generations the witness of our historic faith, that faith once delivered to the saints, to the glory of our King and Head, our Lord and Saviour, Jesus Christ. Rev. Donald Patterson, Jackson, Miss., Chmn. Rev. John R„ Richardson, Atlanta, Ga.
Rev. James Baird, Jr., Gadsden, Ala.
Judge Leon F. Hendrick, Jackson, Miss. Rev. Kennedy Smartt, Hopewell, Va.
Rev. William E. Hill, Hopewell, Va.
Rev. G. Aiken Taylor, Asheville, N.C.
Mr. Kenneth S. Keyes, Miami, Fla.
Rev. John E. Richards, Macon, Ga.
Rev. Ben Wilkinson, Decatur, Ga.
Mr. S. A. White, V., Mebane, N.C.
Coral Ridge Presbyterian Church has had a remarkable history. The Fort Lauderdale, Florida congregation began in an elementary school cafeteria in 1959 with forty seven people under the ministry of D. James Kennedy. Graduating class at Columbia Theological Seminary, 1959. David B. Pedersen, Clarence D. Weaver, Jr. and D. James Kennedy. Preaching his first year of ministry in what he claimed were the fifty-two best sermons ever heard by an American congregation, the attendance dropped from forty seven to seventeen! Upon receiving an invitation from a rural pastor in Georgia to come and preach a week of evangelistic meetings, he gladly accepted, anything to get away from the fiasco then in the making in Florida. Upon arriving in Georgia, the rural pastor, Kennedy Smartt, informed him that in addition to the public proclamation of the Word, Jim Kennedy would be going door to door in the area to personally present the gospel. This badly scared Jim Kennedy. He used to tell people that he couldn’t do personal evangelism because of a “back problem.” If pressed, the “back problem” was a yellow streak down the back. After a bungled attempt at the first “cold” door, the young minister then watched Pastor Smartt lead the person to a profession of faith. In fact, over the next week, he watched Kennedy Smartt lead soul after soul to Christ. What he didn’t know at the time was that the two rural congregations had prayed for the salvation of specific people for two years. Further, just prior to the evangelistic meetings, a young banker has dropped dead. That fact, plus the prayers, made the diagnostic question which began with “Suppose you were to die today,” suddenly real to every citizen in the area. D. James Kennedy would return to his young dying congregation with a new emphasis in soul-winning. 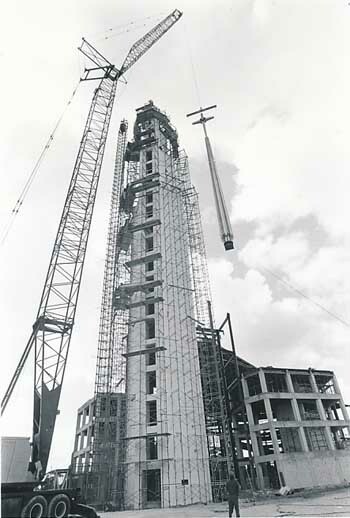 Using the method and later making it his thesis for his Ph.D. degree from New York University, the Coral Ridge Presbyterian Church became the fastest growing church in the Presbyterian Church in the United States, with 8000 in attendance at the dedication of their new building in 1973. All was not well however with their membership in the Presbyterian Church, U.S. Theological liberalism was gaining ground, despite the best efforts of conservatives to win the battle for the Bible. After years of seeking to reclaim the denomination back to its historic stance of biblical faithfulness, on January 8, 1978, the church voted to throw its support to the Presbyterian Church in America. Words to Live By: “The visible church is a society made up of all such as . . . do profess the true religion, and of their children.” (L.C. 62) This answer centers around the phrase “the true religion.” Suppose a denomination with a great past of faithfulness to the true religion slowly but surely turns away from the faith of their spiritual fathers. Suppose that any and all attempts to turn it back fails. There is only one remedy, and that is to leave it for a denomination which still proclaims the whole counsel of God. And that is what this congregation, and countless others, did back in 1973. Praise God for the Presbyterian Church in America. Donald Bray Patterson was born in Quitman, Georgia, July 26, 1923, to James Hastings Patterson and Ethel Bray Patterson. He was raised in the Presbyterian Church, and professed faith in Jesus Christ as a boy. During World War II, he served as a bombardier on a B-24 Liberator in the Army Air Corps in the Southwest Pacific. After the war, he returned to Wheaton College (Ill.), graduating from there in 1948. 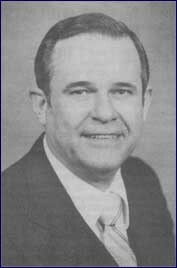 In 1951, Don Patterson received his theology degree from Columbia Theological Seminary, Decatur, Ga. Belhaven College granted him an honorary Doctor of Divinity degree in 1972. In 1947, he married Jeanne Taber in Hackensack, N.J. Three children were born to them: Elizabeth, James, and Shirley. Don Patterson was ordained in the Presbyterian Church in the United States by Athens Presbytery; and his first pastorate was in Commerce, Ga., where he served from 1951 to 1953. He pastored in Perry, Ga., from 1953 to 1958. In 1958, he was called to West End Presbyterian Church, Hopewell, Va., to succeed the Rev. Bill Hill, who had by then gone into full-time evangelistic work. Four years later, Don Patterson became Pastor of McIlwain Memorial Presbyterian Church, Pensacola, Fla. Seven years after that, in 1969, he became Senior Pastor of First Presbyterian Church, Jackson, Miss. Dr. Patterson retired from the pastorate in 1983, and became Minister-at-Large for Mission to the World (MTW), the world missions arm of the Presbyterian Church in America. In 1993, his job description changed to that of Representative for MTW. Don Patterson was one of several key leaders who brought about the formation of the Presbyterian Church in America (PCA). He served on the Steering Committee for a Continuing Presbyterian Church as one of three representatives of Presbyterian Churchmen United. When the announcement was made at Presbyterian Journal Day in August, 1971, that a continuing church, loyal to Scripture and the Westminster Standards, would be a reality, Dr. Patterson was the churchman who introduced the men on the Steering Committee. Two years before the PCA celebrated her silver anniversary in 1998, Dr. Patterson was chosen as one of two Co-Chairmen of the Twenty-fifth Anniversary Celebration Committee. That 24th General Assembly would be the last one he attended. Suffering from illness, he could not make it to the 25th Assembly in 1997. Nor could he attend the 26th General Assembly in the summer of 1998. The Anniversary Committee had hoped to nominate him for Moderator, but his weakened condition caused his absence from the court of the church he loved. The Assembly unanimously bestowed on him the title of Honorary Moderator, and news of this honor was conveyed to him as he lay in bed. Don Patterson continued to fight the illness, but finally succumbed on the evening of December 25, 1998, with his wife of fifty-one years at his side. His passing came exactly three weeks after the twenty-fifth anniversary of the founding of the PCA. The classic church structure pointed its steeple into the gray skies. Outside, it was a cold Sabbath afternoon in Atlanta. Inside, the atmosphere was serious, and respectful, but not gloomy. A crowd of worshippers had gathered to bow before the Lord, and pay respects to one of the faithful warriors of the church militant, who had now entered the church triumphant. Donald Bray Patterson-World War II veteran, Presbyterian minister, church statesman, missions spokesman, pastor to missionaries-had fought the good fight, and had now gone home. Denominational leaders and friends came to remember him and his labors. Several days before, First Presbyterian Church of Jackson, Mississippi, where Dr. Patterson had pastored, was the scene of a memorial service. For this memorial service in Atlanta, Westminster Presbyterian Church was a fitting site. It was here, twenty-six years ago, that the Convocation of Sessions was held which determined to found a new denomination through withdrawal from the Southern Presbyterian Church. And it was Don Patterson who was one of the key players in the Continuing Presbyterian Church movement. Indeed, he was nicknamed the “Mother Bird” by the leaders who looked to him for guidance in those turbulent years prior to the painful ecclesiastical separation. Conducting the service was Dr. Paul Kooistra, Coordinator of the Mission to the World (MTW) Committee of the Presbyterian Church in America. His selection reflected the commitment to world missions by Dr. Patterson, who had served both as a Committee member and an employee of MTW. That burning passion for world missions had led Dr. Patterson and Dr. John Kyle, the first Coordinator for Mission to the World Committee, to pioneer the notion of cooperative agreements, whereby people from the Presbyterian Church in America could serve simultaneously as denominational missionaries and as missionaries with other, independent agencies. Unique at the time, this type of arrangement has been employed by other churches. On that last point, Dr. Smartt referred to an email sent recently to Don and his wife Jeanne Patterson, by Don and Carol Iverson. Those MTW missionaries to Japan expressed great appreciation for the encouragement which the Pattersons had been to them, not only while on the mission field, but also when they were deliberating where the Lord would have them serve. In Dr. Kyle’s eyes, “Don Patterson was like a diamond-you turn it one way and you get this reflection, and you turn it another way and you get another reflection.” His was an Open Door policy, and staff people were continuously ministered to by him. Dave Smith, missionary to Ukraine, said that he would remember Don Patterson for three things. First, with regard to vision, he said, “Don had a vision-even for plumbing, so we could house more people.” His vision extended to the nationals who were being trained as church leaders. Second, with regard to caring, “Don Patterson really cared. . . . He wanted to know what was going on with [the missionaries].” Third, Don Patterson was an example, in the way that he lived his life. John Rollo, who worked for MTW in Atlanta, stated that Don Patterson was the one who got him involved in missions. Ron Shaw said that Don Patterson was a pastor of pastors. Marcus Kyle, another son of Dr. Kyle; Gerald Morgan, who worked as an administrator for MTW; Jim Hughes of Insurance, Annuities and Relief; and Mrs. Strom, retired missionary to India, also shared their thoughts. After the service, the Patterson family, including his widow, graciously received the many congregants who had come. The following is a letter dictated by Don Patterson to one of his daughters, dated December, 1998. Although I had intended to write this letter a long time ago, I left it to the very end. The Doctor doesn’t give me much encouragement for a future life, and I’m taking him at his word. Although none of us know when our time has come, still we know that death is inevitable. Since February, 1997, I have struggled with cancer, then radiation, but worst came when I came back from Ukraine with a solid case of pneumonia. My heart couldn’t take the load and got weaker and weaker. Now it is about to give out. Without your heart, you don’t function very well. My hope is in Jesus Christ, my Savior, who gave His life for me. I stand firm on the promises that God gives in His word. I’m claiming the verse, “Faithful is He who calls you Who will also do it.” I praise Him for the years of service He was allowed me both in this country and overseas. He has been gracious and loving throughout it all. What a joy to know Him as Lord! Jeanne and the children stand beside me constant and caring. I see the love in their eyes. I wish I could greet each one of you personally. I would thank you for all the cards, letters, e-mails and gifts that have poured in during the last year and a half of illness. May our God who made Christmas possible be with you. I soon will see Him face to face. Glorious! To God alone be all glory and praise.